This picture was taken during a gray and foggy autumn day. I don't know about you, but I love these days. They are just perfect for a sunday afternoon. In the distance, you can see the Andes, which is the world's longest mountain range, measuring more than 7.000 Km. Chile has a unique characteristic, due to its long and thin geography: You can go skiing in the morning in one of the Andes many ski centers and be at the beach in the afternoon, enjoying dusk by the Pacific Ocean. What a wonderful photograph. I like the idea of skiing in the morning and being at the beach in the evening. How is the ski season this year? Ours is going really well as we have had lots of snow. I can see a strong feeling between the tops of those buildings and fogs. They seem to be so friends. I've heard that Las Condes is a zone of rich people. Is that right? Nice photo! I like those clouds and the color of the mountains. Irredento: Actually, Las Condes is one of Santiago's biggest communes. There are people from all economic classes living in Las Condes. Marie: I loved your "Doorways around the world" blog. I hope I can send you a picture someday. Eduardo: Chile is without a doubt the most advanced country in LA and for sure a land of many wonders. It is on my to-do list for life to visit your country. Now make sure you bring the good and bad to this blog. Welcome to the DP Circus ! So nice mood rendered here ! Autumn colours are wonderful. La photo dans mon profil a été prise dans un parc au sud du Chili, appelé Torres del Paine (Tours du Paine). C'est vraiment impressionnant. 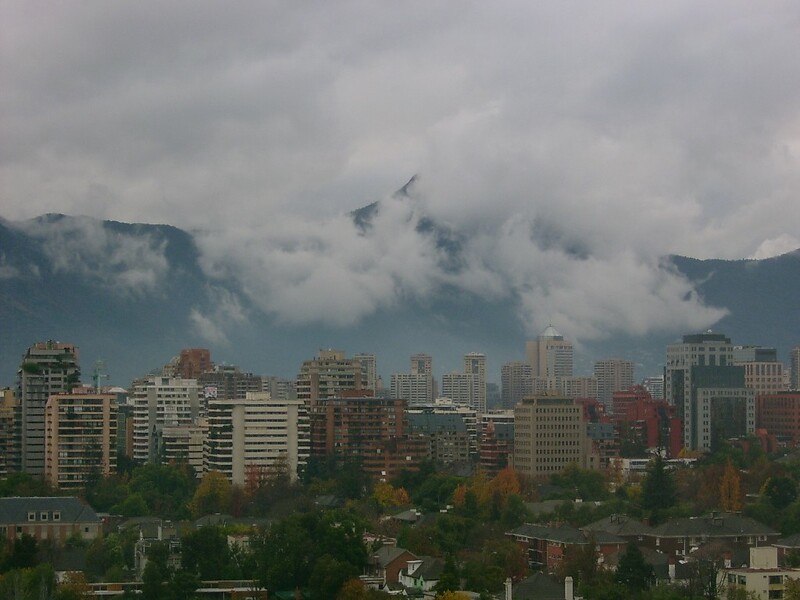 Beautiful picture of Santiago! Nice to see it without the smog. Had it just rained? For those of you interested in skiing in chile you can follow the season on http://www.powderquest.com where we have hundreds of great pictures of skiing in south america.